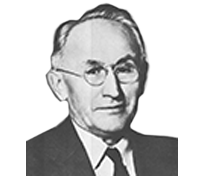 Deister Machine Co. wouldn’t be the company it is today without the founding influence of Emil Deister Sr., who served as president and general manager from 1912 until his death in 1961. Deister, who was born in Germany in 1872, migrated to the United States with his parents in 1878. They settled on an Indiana farm, and by the time Deister was 21 he had embarked on a career as a lathe operator at the Bass Foundry & Machine Co. in Fort Wayne, Ind. About a decade later, after becoming a draftsman and an erecting engineer, Deister began to study ore separation. He later patented his own equipment, including the invention of ore separating tables. According to Deister Machine Co., Deister built his first separating table in his basement. Once completed, Deister won over Arizona mill owners with demonstrations of his development. His very first ore separating tables, which are praised in fellow Pit & Quarry Hall of Famer Arthur F. Taggart’s “Handbook of Ore Dressing” as the first serious competition to the only kind of ore separating table available at the time, were manufactured in 1906 under Deister Concentrator Co. Woodwork for the tables was done in a nearby barn. According to Deister Machine Co., Deister’s differential-motion ore separating tables had riffles attached to their surface. The riffles collected heavier ore particles and transported them toward a collector, while water washing across them carried away light impurities. By 1912, Deister sold his interests in Deister Concentrator Co. and established Deister Machine Co. Fourteen years later, Deister brought vibrating screens for the separation of materials according to particle size to the forefront. Later, with a need to size the aggregate used in hot-mix asphalt plants, he introduced a screen for that unique purpose. Vibrating feeders and foundry equipment such as compaction tables, oscillating conveyors and reclaimers were subsequently introduced. Today, Deister Machine Co. focuses entirely on its core business, providing feeding, scalping and screening equipment to the aggregate and mining industries. Emil Deister’s legacy extends to all 50 states, Canada and an assortment of countries throughout the world, where his 101-year-old company’s equipment is widely used.